Wire and plastic baskets for production, storage and distribution. Plastic trays and containers in polypropylene or polyethylene to food grade. Printing available on distribution basket for identification. Mobile trollies available for both the above. 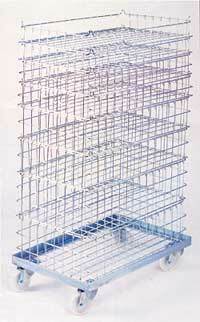 Wire mesh trays in standard 30" x 18" size with 4 varying depths, all stacking. Special sizes manufactured to requirements. Finished in electro zinc plated, chrome or stainless steel.